Oliver Lake: Talkin Stick Publ (SESAC), William Parker: Centeringmusic (BMI). Recorded January 14, 2014, by Peter Karl at Peterkarlstudios, Brooklyn NY. Mixed January 16, 2014, by Oliver Lake, Patrik Landolt and Peter Karl. Mastered by Peter Karl. Cover art and graphic design: Jonas Schoder. Photo: Patrik Landolt. Painting: Jeff Schlanger, musicWitness®: Lake Parker Stone — Original art 39 x 57cm made Live @ The Stone, New York City October 21, 2014. Liner notes: K. Curtis Lyle. 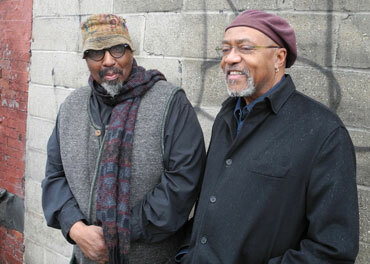 saxophonist Oliver Lake and double bass player William Parker – two important pioneers of contemporary jazz, two great musicians of the USA and two masters of composition and improvisation. After playing a concert in "The Stone" in New York, part of Intakt's festival in January 2012, Lake and Parker took up the label's invitation to record their first album together in Pater Karl's studio in Brooklyn. ﻿K. Curtis Lyle, Liner notes: Hear what this duo collaboration intends and does with sound! It immediately bridges the gap that excludes one art form from another. No need to look for the horizon just 'listen up'! William Parker's vertical spirit sense; the speaking, the writing, the huge heart that shares with and elevates others is evident immediately upon hearing the round depth sound of his bass. The very first eight bars of Variation on a Theme of Marvin Gaye show him extracting individual stars from the collective urn of memory. Oliver Lake, musician, painter, poet, answers / counterpoises with the sound of an eternally awakened weather Buddha map, a sorrow song that always leads home. This is a sound conversation; a call and its instant response. These men lay special logos-claim and entrance to the place that is not a place. In my mind this is the ancient, present and future definition of the shaman. The irresistible force solves the conundrum by embracing the immoveable object. ﻿"To Roy", gewidmet dem Trompeter Roy Campbel, ist die erste Zusammenarbeit zwischen dem Saxophonisten Oliver Lake und dem Bassisten William Parker: Zwei der bedeutenden Pioniere des aktuellen Jazz, zwei der grossen Musikerpersönlichkeiten Amerikas, zwei Meister der Komposition und Improvisation. Nach einem Konzert im Januar 2012 im Rahmen des Intakt-Festivals im New Yorker Club "The Stone" nehmen Lake und Parker auf Einladung von Intakt Records im Aufnahmestudio von Peter Karl in Brooklyn ihr erstes Duo-Album auf. Beide bringen eigene Kompositionen mit. Die Stücke sind von wundersamer Schönheit, der Sound von Oliver Lakes Saxophon und William Parkers Bass verschmelzen, die Duo-Konstellation lässt Raum für Interaktionen, für spannende Improvisationen und atmen die grosse Erfahrung der beiden Musiker. "Roy" is trumpeter Roy Campbell, who died in 2014. After a concert at The Stone in New York, part of Intakt's festival in January 2014, Lake and Parker were invited to record their first album together – which they did just five days after Campbell's death. The resulting disc is divided almost equally between compositions by each, with 2 of Us and the title piece jointly-credited. Lake's compositions, of which Check is a notable example, tend to look back to the duo's loft jazz days – free jazz with Parker strumming furiously and Lake offering the full range of extended techniques. Parker's compositions are more involving, with a clearer pulse – standouts are the opening Variation on a Theme of Marvin Gaye, based on Inner City Blues, and the plangently Ornette-ish dirges Bisceglia – named after the French photographer – and Victor Jara. Parker's formidable arco technique appears to full effect on Lake's Flight Plan and Net Down, supporting the honks and cries of the saxophonist. Lake's playing is intensely bluesy, notably on Variation on a Theme of Marvin Gaye, and he uses flutter-tonguing on occasion. On his own Bonu he plays tinkling bells as Parker strums, in what's aptly been called a blues-tinged processional. 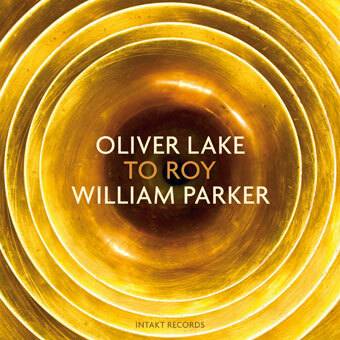 Light Over Still Water Paints a Portrait of God is one of Parker's ornate, evocative titles, with prominent sul ponticello, as it's known in the trade – the bass played close to the bridge to create an eerie, whispering sound. The result is a fine example of latterday free and more traditional playing.